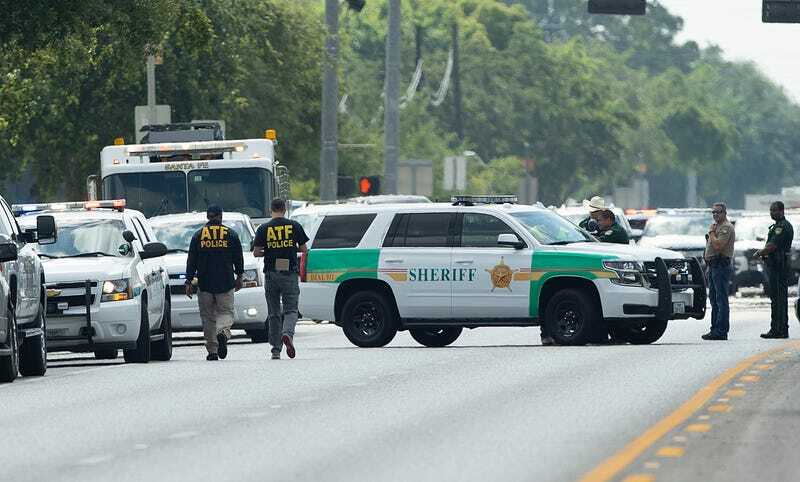 Agents from the Bureau of Alcohol, Tobacco, Firearms and Explosives arrive on location at Santa Fe High School, where a shooter killed at least nine students on May 18, 2018, in Santa Fe, Texas. Updated: Friday, May 18, 2018, 2:17 p.m. EDT: A law enforcement official, speaking on the condition of anonymity, has identified the Santa Fe, Texas, school shooting suspect as 17-year-old Dimitrios Pagourtzis. According to the Associated Press, Pagourtzis plays on the Santa Fe High School junior varsity football team and was a member of a local Greek Orthodox church’s dance group. There were also photos of a gun and a knife, as well as a long green coat with Nazi regalia. At least nine people were killed Friday after a gunman opened fire at Santa Fe (Texas) High School. At least a dozen others were injured in the massacre. According to the Houston Chronicle, police have taken a student suspect into custody and detained another person in connection with the shooting. The gunman was armed with multiple firearms, including an AR-15-type rifle, a pistol, a shotgun and even pipe bombs, a senior law enforcement official who was not authorized to speak about the investigation told the Chronicle. KHOU also reports that police found explosive devices both inside and around the school. The news station described the main suspect as a 17-year-old, whose name has not yet been formally released. Gunfire was first reported at around 7:40 a.m. Friday, with witnesses saying that at least one suspect came into the school and started shooting in an art class. Other students said that the shooter was throwing explosives into a classroom. Two students reported that their friend saw another juvenile with a gun and pulled a fire alarm as they ran away. A teacher also pulled the fire alarm, other witnesses said. Texas Attorney General Ken Paxton issued a statement regarding the shooting at around 10:45 a.m.
“The thoughts and prayers of all Texans are with the people of Santa Fe and those affected by today’s tragic shooting. As horrific reports come out of Santa Fe High School, my office stands ready to assist local law enforcement as needed,” the statement read. As the Chronicle notes, this shooting is the worst to happen since 17 people were killed in Parkland, Fla., in February.